Floods in the Elwha Valley during winter 2017-18 have caused significant damage to Olympic Hot Springs Road south of the Olympic National Park entrance. Consequently, cars are not permitted beyond the entrance station at Madison Falls, and parking is limited. The road is open to walkers and bicycles, with a bypass trail in place around the flood damage. Current discussions suggest placing a new road outside the flood plain around damaged areas, but it will likely be a few years before that happens. If you have the time, take a lovely walk or bike ride up the valley from Madison Falls. It is possible to rent a 15-foot skiff with a 25 horse Mercury outboard motor through the Makah Marina. It is $10 per hour and is a casual rental. By that I mean no liability waiver and no holding a driver's license. This is a reasonable way to see birds inside Neah Bay but should only be used by someone who knows how to operate an outboard motor. The boat comfortably holds 5 and can handle six. PFDs are included in the rental, as is gas. The boat is owned by Big Salmon Fishing Resort. bigsalmonresort.net. 360-645-2374. According to the Olympic National Park website, the Whiskey Bend Road (accessible from the Elwha entrance station) is now open, after being closed through 2016 because of a washout. The Olympic Hot Springs Road is open to the Glines Canyon Overlook, but bicycles and pedestrians are allowed beyond Glines Canyon (the old dam site). These are wonderful areas in spring for migrant birds, and provide good access to the Olympic back country. This is mostly a saltwater route, skirting bays and headlands along the Strait of Juan de Fuca. As you drive west, the terrain becomes increasingly rugged and the roads increasingly curvy. Oceanic influences increase, as does rainfall; forests are dense and fast-growing. At low to mid-elevations Douglas-fir, Western Hemlock, Western Redcedar, Red Alder, and Big-leaf Maple dominate. Sitka Spruce becomes increasingly noticeable west of Clallam Bay, eventually the dominant species of the coastal forest. Areas outside Olympic National Park are managed for timber production, and most have been cut over at least once. The usual low-elevation forest birds can be found wherever there are diverse forests and recent clear cuts, but even-aged stands of close-growing timber have relatively few birds. From Front and Lincoln Streets in downtown Port Angeles, drive 5.5 miles on US-101 to the intersection with SR-112, then turn right (west) on SR-112. In 2.1 miles, turn right (north) onto Place Road after crossing the Elwha River bridge. At 1.9 miles, turn right at the bottom of the hill and park at the end of the road to access the Elwha River Mouth. Follow the trail for about 175 feet, then continue left on the gravel levee 0.3 mile to the beach. A small lake on the west side of the levee often has a variety of ducks. This area has changed dramatically following removal of Elwha River dams upstream. Winter floods have carried huge amounts of sediments formerly deposited in slack water behind the dams, creating a new delta, tide channels, and sandbars at the river’s mouth. The outer sand islands are a favorite roosting and bathing place for many species of gulls, particularly Thayer’s in winter. Look for shorebirds using the new tidal channels and ponds. Although changing substrates may have made this area temporarily less favorable for diving birds, scan beyond the river mouth to offshore Freshwater Bay for coastal species such as sea ducks, loons, grebes, cormorants, and alcids. A side trip up the Elwha River into Olympic National Park (see map on next page) provides excellent birding from mid-April through mid-July, along with a look at one of the greatest ecological experiments of the early 21st century—the removal of two century-old dams on the Elwha River to restore salmon runs and benefit the entire river ecosystem. To get there from downtown Port Angeles, follow US-101 westbound 5.6 miles from the corner of Front and Lincoln Streets to the intersection with SR-112. 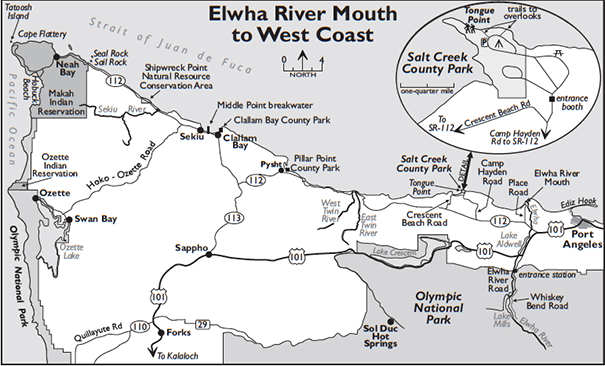 Continue straight on US-101 for 3.0 miles, and turn south (left) onto Elwha River Road. The entrance booth for Olympic National Park (fee or pass required) is in 2.0 miles. Look for Harlequin Ducks, Northern Rough-winged Swallows, and American Dippers along the river, and search for flycatchers (particularly Hammond’s), vireos, warblers, and other neotropical migrants in the deciduous trees around the entrance meadow. Continue past a campground and ranger station, and in 2.0 miles turn left onto Whiskey Bend Road (unpaved and narrow), which climbs about four miles up the east side of the Elwha Valley through magnificent forests to a trailhead parking lot (elevation 1,205 feet). In May and June hike the Humes Ranch Loop (4.3 miles) and its superb mixed forest trails to hear neotropical bird songs and occasional Northern Pygmy-Owl in the bottomlands between Goblin Gates and Humes Ranch. Returning from the Elwha River mouth via Place Road, turn right (west) onto SR-112 and continue west for 5.0 miles to Camp Hayden Road. Turn right (north), and stay right at the fork in 3.4 miles to the entrance of Salt Creek County Park. This park contains a nice campground and Tongue Point, one of the best rocky tidepool areas in Washington. In warmer months with low daytime tides it may be very busy, but most of the year it is uncrowded. Where the road forks after the entrance booth (no fee for day use), stay right and drive north to the edge of the bluff. Park at the overlook to view the extensive kelp beds—a good place for Harlequin Duck and Marbled Murrelet. Other waterbirds may be present, so check offshore with a scope. In late September and early October, watch for kettles of Turkey Vultures crossing the strait from Vancouver Island, sometimes several thousand in a day. Continuing west through the wooded portion of the campground, you will arrive at small parking areas with stairs to Tongue Point, marked by interpretive displays. The point is worth exploring at low tide, especially if you have an interest in intertidal creatures. The algae can be very slippery, so a walking stick and rubber boots are recommended. Look for rocky shorebirds, including Black Oystercatchers, Black Turnstones, and occasional Surfbirds. River Otters are common. The more westerly overlook offers scope views of Crescent Bay. Long-tailed Ducks stay here surprisingly late into spring. Return to the park entrance and turn right onto Crescent Beach Road to return to SR-112. Turn right at the fork in 3.2 miles, and in another 0.3 mile resume traveling west on SR-112. The first sight of the Strait of Juan de Fuca after leaving Crescent Bay comes in 11.7 miles when the road winds downhill to the Twin Rivers. This north shore of the Olympic Peninsula is an important wintering area for sea ducks along with Horned and Red-necked Grebes. Marbled Murrelet surveys in summer reveal that a significant portion of the state’s breeding population uses this coastline, likely nesting in Olympic National Park old-growth forests. In 9.2 miles, turn right to the entrance of Pillar Point County Park, another good access to scope for coastal birds. Continuing west on SR-112, in another 6.6 miles SR-112 meets SR-113, which leads south to US-101. Instead, turn right (north) on SR-112, to downtown Clallam Bay. Just as SR-112 makes a sharp left bend within the town of Clallam Bay (6.2 miles), turn right into a parking area (brown sign indicating Clallam Bay Community Beach Entrance). This is Clallam Bay County Park. Scoping the bay, lagoon, and river is frequently productive for waterfowl, alcids, and gulls, particularly Marbled Murrelets. Look along the river’s edge for the occasional Green Heron. The park’s bridge over the Clallam River lagoon, partly destroyed by beach erosion, is passable using a ramp placed by the Clallam County Parks Department from spring to fall, but the ramp is removed during winter. Regardless, the bridge makes a good scoping platform all year even if the beach is inaccessible. Return to SR-112 and turn right (west). Halfway between Clallam Bay and the picturesque fishing village of Sekiu (pronounced C-Q) is Middle Point breakwater (1.2 miles), worth searching for rocky shorebirds, roosting gulls, and offshore birds. Continuing on SR-112, at 0.6 mile turn right (north) on Front Street into Sekiu, and from various vantage points check the bay and offshore waters for sea ducks, grebes, cormorants, and gulls. Return to SR-112 and turn right (west) toward Neah Bay. At 2.2 miles SR-112 intersects the Hoko-Ozette Road to Lake Ozette, a pristine area with trail access to wilderness beaches. Birders have turned up a surprising number of eastern vagrants (Eastern Phoebe, Northern Parula) near the Ozette campground and ranger station, and the lake is one of the few places in Western Washington with nesting Common Loons. SR-112 continues across the Sekiu River mouth 2.8 miles farther west, a good place to scope for gulls. From here to Neah Bay the scenic, winding road hugs the coast and travel is slow. In winter the waters hold diving ducks, loons, grebes, and alcids, but parking along this stretch of highway is limited, other than at Shipwreck Point Natural Resource Conservation Area (3.2 to 4.4 miles). Search the rocky intertidal there for Wandering Tattlers during spring and fall migration, along with Black Oystercatchers, Black Turnstones, and Surfbirds. Gray Whales summer along this portion of the strait. The best viewpoint for Seal and Sail Rocks, the only seabird nesting islands along this shore, is at 9.2 miles from the Sekiu River, on an outside curve just before the commercial sign for Snow Creek Resort. Scope the rocks and surrounding waters for marine mammals and a variety of birds, including all three cormorants and Tufted Puffin. Continue west 3.2 miles to the community of Neah Bay, home of the Makah Tribe. Neah Bay and surrounding areas are a birding treasure, both for western migrants and vagrant species that funnel through this northwesternmost point of land in the Lower 48 States. But remember that you are a guest on the Makah Reservation. 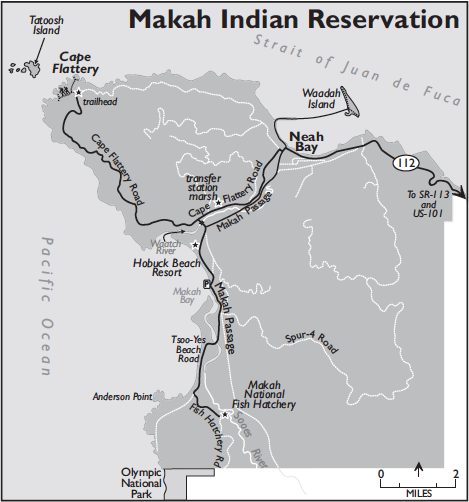 You must purchase a Makah Recreation Permit at the Makah Museum, Washburn’s General Store, or the Makah Mini Mart as you enter town. The permit allows you access to trails, beaches, and designated visitor facilities, including at Waatch Valley, Hobuck Beach, and Cape Flattery. Scan all of Neah Bay and its beaches for ducks, loons (including Yellow-billed), grebes, shorebirds, alcids, and gulls. Bald Eagles nest around the village and gather on the shorelines, visible year round. Pelagic birds sometimes seek shelter or wreck in the bay, including Northern Fulmars, phalaropes, Black-legged Kittiwakes, and, rarely, Fork-tailed Storm-Petrels. Search shrubby areas and shorelines in town for songbirds, which may form abundant flocks during migration. Across the street from the Makah Mini Mart is a scrubby alder forest known as Mini Mart Woods, where numerous vagrants have turned up in recent years. Search the gull roosts along the beaches and particularly at the mouth of Village Creek west of the Makah Senior Center (the last large building on the waterfront) for a variety of gulls, including Glaucous, Iceland/Kumlien’s, and others. Beyond Village Creek and the monument for Fort Nuñez Ganoa, walk the Boom Road (aka Makah Passage) along the western edge of Neah Bay to the breakwater to Waadah Island, searching the brush and trees for migrant songbirds and the beaches and breakwater for ducks and shorebirds. Birding Neah Bay during migrant fallouts can be spectacular, with hundreds of birds everywhere. Realistically, vagrants could show up anywhere in town. After passing the Senior Center, follow the road signs to Cape Flattery. Cape Flattery Road continues south through alder woods and then curves west, paralleling the Waatch River (pronounced WY-atch), a short river system that forms a tidal grass estuary. As an island of open grass along the coast, the valley is attractive to many species unusual to wooded, wet Western Washington. Walk and drive both the paved Cape Flattery Road and unpaved Makah Passage, stopping at turnouts to scan the river and to search clumps of vegetation. All migrant flocks in the area should be searched closely for vagrants. At 2.0 miles from the Senior Center, a marsh on the right before the transfer station is a good spot for wintering Swamp Sparrow, and Rock Wrens have been found at the adjacent quarry/landfill. Search the power lines and fencepost perches for raptors, kingbirds (including Eastern and Tropical), shrikes, and bluebirds. Scan the marshes and riverbanks for geese, swans, herons, vagrant egrets, and shorebirds. Raptors circle overhead in April and May as they prepare for their flight north over the Strait of Juan de Fuca. In addition to the usual coastal migrants, search all soaring raptors overhead for Golden Eagles and buteos such as Swainson’s and Broad-winged Hawks, which have been seen from nearby Bahokus Peak. At 2.5 miles from the Senior Center, turn left onto Hobuck Road to cross the Waatch River bridge. Bear right in 0.1 mile, then continue 0.3 mile to Hobuck Beach (rental cabins and campground, daily use fee paid at entrance booth, or park at the far south end of the beach 0.8 mile farther). This is an extraordinary beach and dunes area known to concentrate vagrants. Walk to the north end of Hobuck Beach, at the Waatch River mouth, to view the multi-species gull roost, which may contain thousands of migrant California Gulls in summer and fall, along with any possible gull species in Washington, including kittiwakes and Iceland/Kumlien’s and Glaucous Gulls. Look for shorebirds along the beach and river mouth; Snowy Plover has been found here. Walk trails in the grassy dunes behind the beach to search for migrant and vagrant songbirds, which may hide in the stunted Sitka Spruce/willow forest. Many songbirds unusual to Western Washington have appeared here, along with incredible numbers of western species during migration fallouts. From the south end of Hobuck Beach, drive south in the next quarter-mile to view the mouth of the Tsoo-yess River (aka Sooes) and adjacent beaches. Continue south on Fish Hatchery Road 3.2 miles to the Makah National Fish Hatchery, where trails allow access to ponds and mixed woods that are attractive to Wood Ducks, mergansers, and migrant and nesting songbirds. Return to the Waatch River bridge, but just before crossing the bridge turn right (east) onto Makah Passage Road, which parallels the river. The adjacent wetlands and islands of brush in the Waatch Valley have turned up an amazing variety of western migrants and vagrants; it is worth walking down and back to find birds. Return to and cross the Waatch River bridge and turn left (west) on Cape Flattery Road. Drive 5.2 miles to the Cape Flattery trailhead, traversing mixed forests and brushy spots. In late spring the songs of Pacific-slope Flycatchers, Swainson’s Thrushes, and Wilson’s Warblers, along with ever-present Pacific Wrens, resonate through these forests. Carry a scope down the three-quarter-mile Cape Flattery trail—well designed with boardwalks across the wet places—to viewing platforms overlooking the Pacific Ocean at the northwestern tip of the Lower 48. Seabird watching can vary from fair to excellent, depending on weather and visibility. Pigeon Guillemots nest immediately below the overlook in large caves at the base of the 100-foot cliffs. All three species of cormorants roost on the slopes below, with Pelagic Cormorants nesting on surrounding cliffs. Search for Brown Pelican, Black Oystercatcher, Rhinoceros Auklet, Black and Vaux’s Swifts (late spring and summer; unpredictable), and Peregrine Falcon. Look for Rock Sandpipers in neighboring surge channels during migration. With a scope, search for shearwaters and their distinctive flight style coursing the waves beyond Tatoosh Island. Marine mammals include Sea Otter, Steller Sea Lion, Harbor Seal, Gray Whale, and Harbor Porpoise. Tatoosh Island, one-half mile offshore and viewable with a spotting scope, supports several species of nesting seabirds, including Pelagic Cormorant, Common Murre, Pigeon Guillemot, Rhinoceros Auklet, Tufted Puffin, and Glaucous-winged and Olympic Gull (a hybrid of Glaucous-winged and Western). This is probably the easiest place in Washington to see puffins from shore, from May to August. Fork-tailed and Leach’s Storm-Petrels, along with Cassin’s Auklet, nest on Tatoosh as well, but these highly pelagic species visit their nest burrows only at night and are rarely seen from land during the day. A spectacular sight in spring is the evening gathering of thousands of Common Murres as they fly by cliffs and cluster on the water below. The number of murres nesting on Tatoosh Island has varied significantly over the last century, but recent nest predation by the burgeoning Bald Eagle population has become a significant threat. Tatoosh Island is also a landbird migrant trap. Numerous vagrants have been recorded by researchers, among them White-winged Dove, Brown Thrasher, Blackpoll Warbler, and Lark Bunting. The island is part of the Makah reservation and access is highly restricted. But the same vagrants could just as well show up at nearby coastal locations, and regular birding forays to this area could repay the effort. To continue down the outer coast, return 26.8 miles from Neah Bay to the intersection of SR-112 and SR-113, then continue south another 10 miles via SR-113 to US-101. Turn right (south) on US-101 toward Forks, or left to return to Port Angeles.